You’ve probably come across Traidcraft Exchange’s ‘Who picked my tea?’ campaign. But we also have a long-established programme of working directly with small tea growers. George Williams talks us through some learnings and reflections emerging from that work. The Traidcraft Exchange Tea Programme was initiated in the early 2000s, building on our practical experience gained in developing tea supply chains for business partners. The programme spans central Kenya, northern Bangladesh, south and north-east India. It focuses specifically on smallholder tea farmers – those cultivating 2 acres or less of land, known within the industry as ‘Small Tea Growers’. To date the programme has reached over 66,000 small tea growers in India, 26,000 in Kenya and 5,000 in Bangladesh. Late last year we commissioned an independent evaluator to document the programme’s achievements, approaches, and learning; the resulting briefing is available here. In the meantime, here’s a quick overview of some of the most interesting bits. The Tea Programme aims to work across the whole supply-chain, ensuring efficiencies generated by improved supply chain management lead to benefits for all players. At the same time, however, it recognizes that small growers are amongst the most vulnerable and least-powerful players within these chains. Therefore, the programme works intensively with small growers to ensure that they can capture an increased proportion of the value available in the chain. The diagrams below seek to represent how we do this: each element is explained more thoroughly in the briefing. As mentioned above, in recognition of the vulnerability of small tea growers within supply chains and across the sector more widely, at the same time as utilising the ‘whole supply chain approach’, the programme works intensively with small growers. The six core components of the approach are represented below and explained more fully in the briefing. What have we learnt from taking this approach? It’s all about power. Tea is a well-established cash crop in all target countries. As such the programme has had to engage with entrenched interests and local elites. Understanding how power operates in each context is critical: sources and forms of visible, invisible and hidden power; the impact of power relationships within supply chains, and between private, public and civil society actors. A structured process of power and vulnerability analysis helps develop a shared understanding of how power works, who benefits, how it can be changed and where resistance might come from. Be clear about what is achievable and by whom. 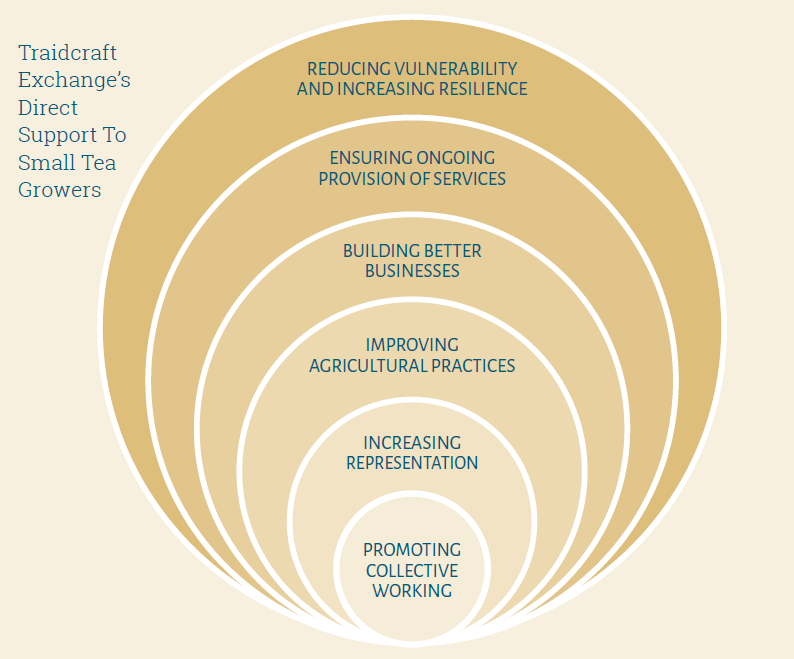 Traidcraft Exchange’s natural position is to follow a multi-stakeholder approach that seeks to understand the perspectives of different stakeholders and look for the win-win solutions that bring benefits to all, resulting in more efficient, effective and sustainable supply chains in which value is more equitably shared. A beautiful theory, but in situations where power is very entrenched it can be hard to put into practice. In some contexts, there may be a need for power to be challenged to become more accountable and transparent – but this may not be a role for an international NGO; building the capacity of local institutions can more appropriate and effective. Sustaining collective working. Collective working is fundamental to the programme’s empowerment approach. However, sustaining small grower interest in and the collective identify of groups/societies has proved challenging in some contexts. Institutions need to respond to felt needs and deliver real benefits to members if they are to sustain. Diversification for empowerment. 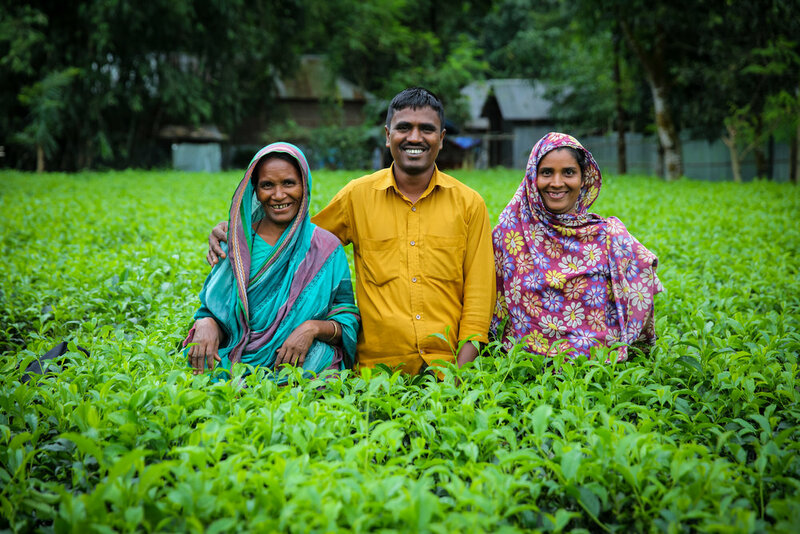 Alongside collective working as a route to economic and social empowerment, the programme has worked with small growers to diversify away from their reliance on tea. In Kenya, for example, we have worked with small growers to take-up beekeeping. The work has been well received, with growers reporting increased income, improved cashflow and reduced indebtedness. In the longer term it also contributes to greater power to leverage change in the tea supply chain by reducing dependency. Change in income as a proxy for change in power. Change in income is a key impact indicator. However, measuring income change is challenging and attribution even more so. Given the volatility of tea prices, ‘snapshot’ percentage increases can be misleading. More fundamentally, do changes in income level provide a good enough picture of shifts in the balance of power? It may take time for shifts in power to translate into income increases, and there may be times when producers earn more, even if the balance of power hasn’t shifted, for example through improving efficiency and reducing costs. The situation for tea workers. The ‘Who picked my tea?’ campaign has raised awareness of the appalling working and living conditions for tea estate workers in Assam, and shone a light on how UK purchasing practices impact the lives of both farmers and workers, particularly women. Our Tea Programme has, however, focused largely on small tea growers. In some contexts (e.g. the nascent small grower sector in Bangladesh) growers rely on family members for tea picking. However, in other contexts, small growers do employ labourers. Whilst independent evaluations of the programme have evidenced improvements in income level for small growers, to date the programme has not be able to successfully engage with labourers to ensure they also benefit. We thank our programme partners for their ongoing hard-work and commitment: CEC, Bikash, CPDA and Iriani Tea Factory. The programme has been generously supported by grants from the UK’s Department for International Development, the European Union, Christian Aid, as well as numerous Trusts and Foundations. Thank you for making this work possible.